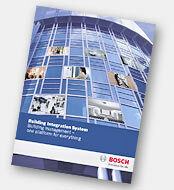 The Building Integration System combines a number of technical systems: fire and intrusion alarm, video monitoring, access control and evacuation systems from Bosch and also 3-rd party equipment. All on one modular platform. Efficient building management is becoming not only more important, but also a more complex challenge. Nowadays organizations use multiple systems to monitor and control their buildings, ranging from fire and intrusion alarm to access control, video surveillance and building automation systems. Monitoring, control, administration and maintenance of all these systems can be a huge challenge because individual systems only serve individual purposes. To completely secure and manage a building, you need a number of functions – and if you want them all, they have to run alongside each other. This approach is not only inefficient, unreliable and expensive, but also difficult to upgrade when your requirements change. This is where the Building Integration System comes in. The idea is one solution that offers everything – combining different building management functions on one platform, and providing simple responses to difficult questions. But because every organization has unique building management requirements, the Building Integration System is modular. This means that, like with building blocks, you can add or remove single elements or create new combinations, which gives you maximum flexibility. This guarantees that you get the solution you need. No matter how comprehensive and complex your building management requirements are, the BIS responds flexibly and is also extremely easy to use. The Building Integration System combines a number of technical systems: fire and intrusion alarm, video monitoring, access control and evacuation systems. All on one modular platform. It’s only possible to protect something you can see. That’s why the Building Integration System offers a complete overview of your organization with all subsystems, right down to showing the status of individual detectors. This is a major prerequisite for promptly and appropriately responding to dangerous situations. 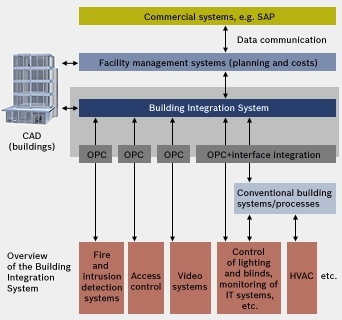 The Building Integration System works exclusively with tested open global IT standards such as OPC, SML, HTML and Windows - which makes it easy to integrate both third-party security and building management systems. This results in numerous synergies and optimal service. It doesn’t require much to train future users. Your return on previous investments is extended and your future options remain open. Plus, you have a security management system that is not only extraordinarily efficient but is also compatible with existing structures down to the last detail. Preexisting CAD data can be integrated without having to convert split diagrams. Subsystem configurations as well as personnel data from an HR or time management system can be directly imported – there’s no need to reenter them in the Building Integration System. And because the system is OPC-compliant it interfaces with a range of standard field buses such as EIB, LON, Profibus and BACnet. changes. This protects data from manipulation. The logbook is both easy to use and flexible, due to advanced filter functions and the ability to export data in standard CSV format. In the event of danger, the system displays alarms based on location maps and other alarm documentation. Animated detector symbols and audible signals immediately indicate the source of the alarm. You can also define escalation scenarios to ensure immediate and appropriate responses. To perform optimally, a building management system must suit your particular needs. But even more important: a good system should be able to cope with later changes. What you need today may turn out to be too little further down the road. And who wants to buy a whole new system just because the requirements have changed? This is why the Building Integration System is modular: different high-performance modules (engines) share a single platform and can be flexibly combined. The Building Integration System offers a suitable solution for every requirement and is correspondingly versatile. The examples here are only some of the areas in which the system is now being used with success. No matter how comprehensive and complex your building management requirements are, the BIS responds flexibly and is also extremely easy to use. It combines a number of technical systems: fire and intrusion alarm, video monitoring, access control and evacuation systems. All on one modular platform. Convince yourself by watching our demonstration videos. For the special requirements in prison applications our long business experience is a huge benefit for our customers. Bosch Security Systems offers solutions that help the officers perform their jobs safely and more efficiently, with solutions including AutoTrack – motion tracking cameras and BIS – complete system integration software.